Looking through some of the pictures on my wife's camera I came across some that I had completely forgotten about. 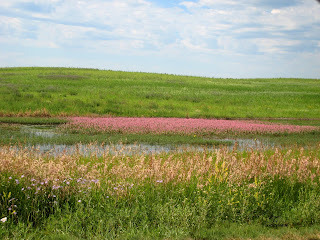 The pictures in question were taken when we were in southern Saskatchewan in the grasslands this summer. 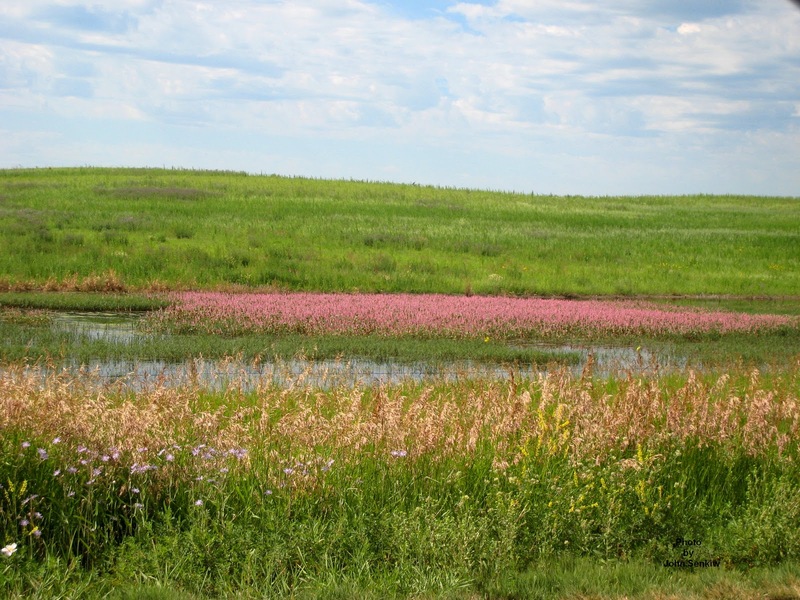 The photos that really caught my attention were the ones taken of sloughs filled with Purple Loosestrife, a garden flower with no natural enemies, that has become a noxious weed. This imported species is very invasive and very difficult to eradicate once established. The different levels of government have banned the cultivation of any relatives of this plant but it is a little late in some parts of the country. Fortunately, it has not established itself locally. In keeping with the harvesting hunting theme I am featuring another game duck, our smallest dabbling duck, - the Green-winged Teal. The name, teal, has no scientific meaning at all but, through common usage, it is a name applied to the smallest dabbling ducks. 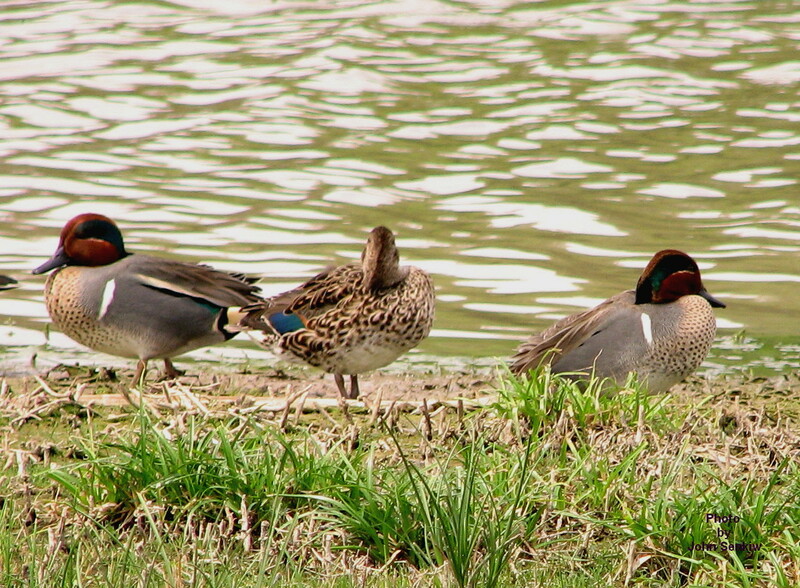 There are three teals in Canada two of which, the Green-winged and Blue-winged, are common around here. The third, the Cinnamon Teal, is a bird of the west and south of this continent that is relatively common in the south western parts of our province but is only a straggler locally. With respect to field marks the drake Green-winged Teal is a small greyish duck with a rich chocolate brown head featuring a broad green eye stripe much like the Widgeon except the Widgeon has a grey head. At close range or with binoculars the dull yellow flanks near the tail are clearly visible and are definitive in identifying this smallest of our dabblers. Another useful field mark is the vertical white slash just in front of the wing that is clearly visible when the duck is on land or swimming. As with the Blue-winged Teal the wing patches of the Green-winged teal can only be seen in flight unless the bird is preening. The hen is a drab brown but is usually in the company of the drake, except when rearing young, making identification easy. The picture of the Purple Loosestrife was taken near Coronach and the picture of the Green-winged Teals was taken at the Llano Grande nature preserve in Weslaco, TX. 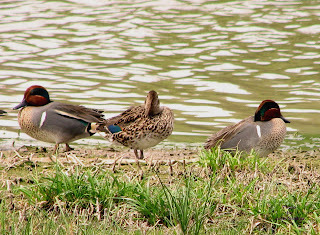 For a good sense of the colours of the teal consult a bird book or log on to my website: www.johnthebirder.com. The Purple Loosestrife will not be in a bird book so the website is the only choice. Enjoy.